µDIRAC which stands for Determination In situ by Rapid Analytical Chromatography was designed by the University of Cambridge to measure halocarbons in the atmosphere. It evolved from the original design of other instruments named DESCARTES and DIRAC to meet the need for more flexible, autonomous, low power halocarbon analysis. It was originally designed for use on Montgolfier Infra Rouge (MIR) long duration balloons. However, it has proven versatile and has also been used in aircraft and ground-based deployments. The instrument is a temperature programmed gas chromatograph with electron capture detector (GC-ECD) that measures a range of halocarbons (including short-lived tracers having biogenic and anthropogenic sources) with measurement precision relative standard deviations ranging from ± 1% (CCl4) to ± 9% (CH3I). µLIDAR also known as MULID which is the first lightweight balloon-borne microlidar ever built. It was developed by CNR-ENEA to measure the depolarized signal backscattered by cloud particles. It's light source is a solid state laser of 1.5 µJoules of power that operates at a repetition rate of 1 kHz and at a wavelength of 532 nm. The receiver is composed by a Newtonian modified reflector telescope and the detectors are two photo-multipliers modules used to collect the backscattered light and to divide it according to its wavelength. The whole system (weighting 4 kg) is enclosed in an insulating polyurethane shield to reduce heat exchange with external environment and externally covered by a reflecting Mylar microfilm. 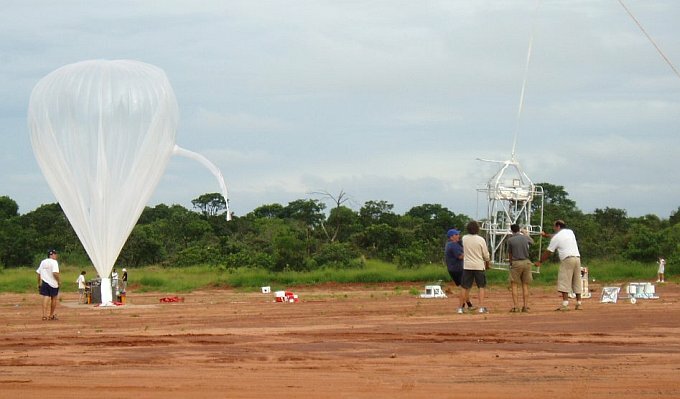 The gondola final weight including batteries and balloon control systems is of 10 kg. The µSDLA (Micro Spectrometric Diode Laser) developed by CNRS-SA is a diode laser spectrometer devoted to the in-situ measurement of H2O and CH4 in the UTLS (upper troposphere low stratosphere) by infrared absorption spectroscopy. Three near-infrared telecommunication-type InGaAs laser diodes are connected by means of optical fibers to an open multipath optical cell providing an absorption path-length of 28 m. The laser beam is absorbed by ambient gas molecules as it is bouncing back and forth between the cell mirrors. CH4 is monitored at 1.65 µm and H2O at 1.39 µm using the differential detection technique. The payload also includes pressure and temperature sensors. 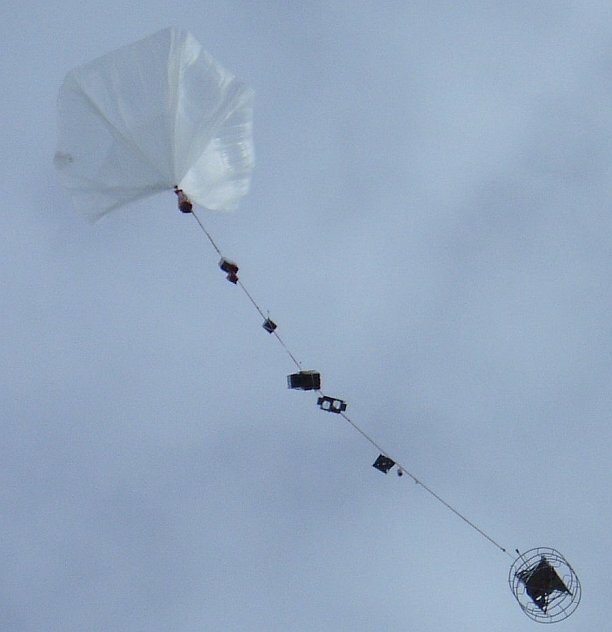 To avoid contamination by out-gassing from the balloon or the payload, only data recorded during the slow night-time descent of the balloons are considered, continued by those during parachute descent in the lower troposphere. The Surface Acoustic Wave (SAW) H2O sensor is a frost point hygrometer developed by the University of Cambridge that uses a surface acoustic wave (SAW) crystal instead of the classic cooled mirror and optical detector. The SAW crystal is placed, together with an accurate platinum resistance thermometer, onto a Peltier cooler. When cooled to the frost point, water vapour condenses onto the SAW surface, reducing the SAW oscillation frequency and amplitude, forming the basis of a feedback circuit. The temperature at which condensation occurs is then related to the ambient water vapour amount. The Solid State Ozone Sensor (SSS O3) developed by the University of Cambridge consists of a thin tungsten oxide layer mounted on a small ceramic tile. When is heated to its operating temperature, oxygen vacancies, formed thermally at the oxide surface, create electron donor states, resulting in an increase in charge carrier concentration. Ozone molecules react filling the oxygen vacancies, thus decreasing the charge carrier concentration. Measuring the change in electrical resistance, lead to infer in a few seconds the ozone concentration. Its weight is less than 0.5 kg, excluding batteries. The AIRS electric field instrument developed by the Centre d'Etude des Environnements Terrestre et Planetaires was designed to measure the vertical component of the atmospheric electric field from DC to 10 kHz and the electric conductivity of the atmosphere through the relaxation technique. It uses the double probe technique with 2 carbon coated cylindrical electrodes, 3 cm in diameter and 15 cm long, installed at the ends of a vertical boom, 1 meter in length, located 25 cm away from the gondola. Grounded plates, also coated with carbon, are installed on the sides of the gondola. Data are recorded in 2 channels, one for large amplitude DC signals, and the second one for low amplitude AC signals. The SF4 mission was the third slow descent flight that was performed during the HIBISCUS campaign. 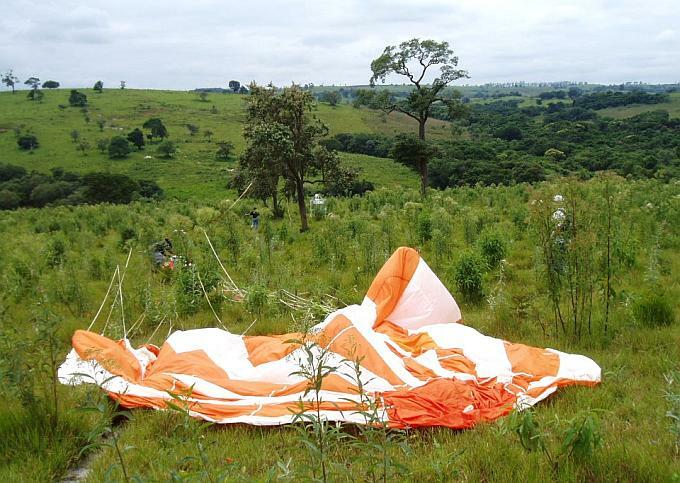 The balloon was launched from Bauru, Brazil (22.36 S, 49.02 W) at 20:03 utc (17:03 local time) on 24 February reaching an altitude of 20.2 km shortly before sunset, followed by a 3 hour slow descent down to 10.7 km, when it was cut down. StratoCat is a non-profit, educational and informative website created, developed and programmed by Luis E. Pacheco. It is based on an idea first conceived by the author in 2001 and is online since September 17th, 2005. This website is an independent initiative, and thus is not endorsed, supported or have any relationship with any governmental or private agency or company in the balloon field. Page generated on 3-Dec-2018 - 10:06:42pm © StratoCat 2005~2018 - All Rights Reserved.